The SVCS mainly results from thrombosis or stenosis of the SVC. Thrombosis is a well-recognized complication of central venous catheterization and its overall incidence ranges from 0 to 13%. Catheter-induced trauma to the venous endothelium at the time of placement may be a triggering factor. This is followed by inflammation and coagulation resulting in intravascular thrombosis. Thrombolysis is highly successful within two days of the onset of symptoms and is ineffective when started more than ten days after the onset of symptoms. In patients who present with SVCS of longer than ten days duration, along with removal of the catheter, systemic anticoagulation with heparin infusion followed by oral warfarin, keeping target INR of 2.5-3 for at least three months, is needed. When thrombolysis and anticoagulation fail, endovascular interventions such as transluminal balloon angioplasty or surgical reconstruction are planned. We present a case of chronic SVCS secondary to central venous catheter placement for hemodialysis. A 50-year-old male patient with hypertensive end-stage renal disease on maintenance hemodialysis for four years in our unit presented with slowly increasing neck and facial edema and asymmetric swelling of upper limbs. In the past, he had dialysis initially through femoral and right internal jugular venous catheters prior to using an arterio-venous fistula (AVF). He had repeated failure of AVF in both the hands. Since the femoral and right internal jugular veins were used earlier, Doppler study was performed which did not reveal any thrombus in these veins. To sustain life and since the right internal jugular vein was used earlier, he was continued on dialysis through a left internal jugular vein catheter, with the catheter tip placed in the SVC. However, the catheter had to be removed after a few weeks due to inadequate flow secondary to thrombosis. As there was no other alternative, on persuasion, he agreed for continuous ambulatory peritoneal dialysis and was maintained on this modality thereafter. The evaluation for facial and neck edema using computed tomography angiogram revealed thrombosis of the SVC on the right side as well as the left internal jugular vein [Figure 1] and [Figure 2]. He developed subcutaneous hematoma in the left lumbar region while on heparin for the management of SVCS, and hence, anticoagulant therapy was discontinued. Patient declined any endovascular or surgical procedures. Figure 1: CT angiography of neck and thorax showing thrombus in the right superior vena cava. 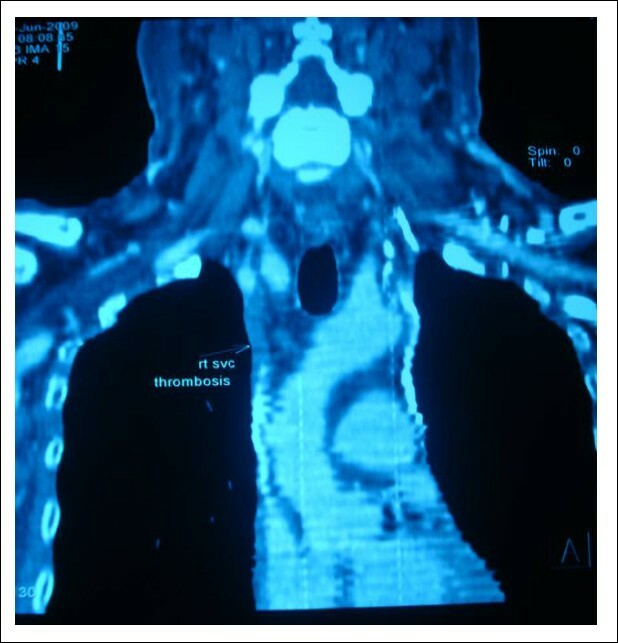 Figure 2: CT angiography of neck and thorax showing thrombus in the left internal jugular vein (straight arrow) and thrombus in the left persistent superior vena cava (dotted arrow). While on CAPD, there was partial improvement in the facial and upper limb edema, secondary to formation of collaterals between the superior and inferior vena cava. He was not willing to undergo renal transplantation. This case report highlights a) the slow development of SVCS, secondary to remote jugular catheterization and b) importance of CAPD as a valuable alternative modality of management to sustain life. 1. Akoglu H, Yilmaz R, Peynircioglu B, et al. A rare complication of hemodialysis ca-theter. Superior vena cava syndrome. Hemodial Int 2007;11:385-91. 2. Barbeito A, Bar Yosef S, Lowe JE, Atkins BZ, Mark JB. 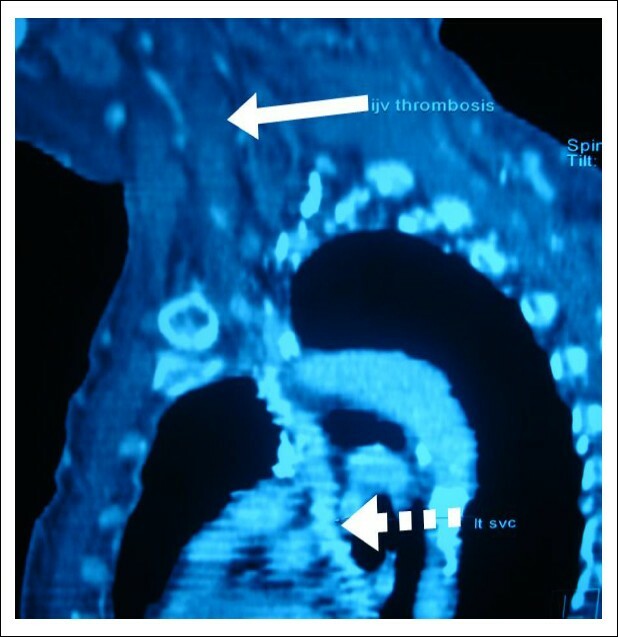 Unusual cause of superior vena cava syndrome diagnosed with Tran-esophageal echocardiography. Can J Anesth 2008;55:(11): 774-8. 3. Seeling MH, Oldenburg WA, Klinger PJ, Odell JA. Superior vena cava syndrome caused by chronic hemodialysis catheter: Autologous reconstruction with a peri-cardial tube graft. J Vasc Surg 1998;28(3): 556-60. 4. Al-Hilali N, Nampoory MR, Ninan VT, et al. The superior vena cava syndrome: Late presentation after hemodialysis catheter removal. Saudi J kidney Dis Transpl 2003; 14(2):186-9. 5. Unver S, Atasoyu EM, Evrenkaya TR, Ozmen NY, Arslan Y, Karaman B. Vena cava superior syndrome developing in a dialysis with anti-thrombin III deficiency following temporary catheterization. Clin Nephrol 2006;65(1):71-4. 6. Sriramnaveen P, Krishna Kishore C, Sainaresh VV, et al. Placement of dual lumen non-cuffed dialysis catheter into persistent left superior vena cava. Clin Nephrol 2010;73(1):81-2.